When I saw photos of the Blue Lagoon, Iceland, I was intrigued but wary. The beautiful, milky blue water looked inviting, but I’d been warned that the Blue Lagoon was a tourist trap. In the end I decided it was worth the risk to see it and I’m glad I did. Even though the sky was overcast, visiting the Blue Lagoon was a great experience. The Blue Lagoon (Bláa lónið) is a man-made geothermal spa located between Reyjavik City and Keflavik International Airport in Iceland. It came about accidentally when the runoff from a geothermal power plant pooled and formed a temptingly warm pool. 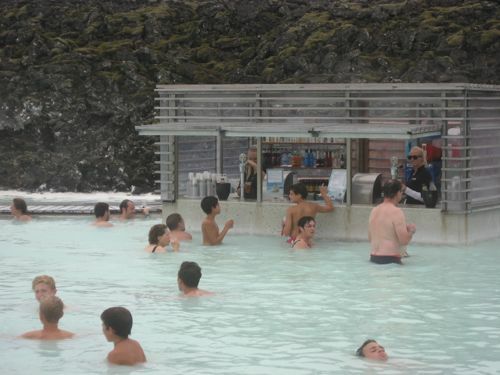 The Blue Lagoon is crowded and a bit expensive, but it’s a must-see on your trip to Iceland. 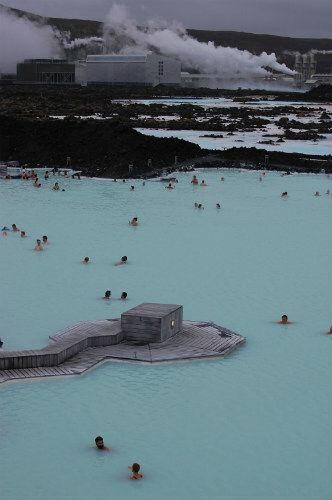 Many people visit the Blue Lagoon geothermal spa on their way to or from the airport since it’s about 50 minutes from Reykjavik and 20 minutes from Keflavik airport. If you have a rental car, it’s an easy stop on your way to Reykjavik. Just follow the signs for Bláa lónið off of Route 41. We were jet-lagged, though, so we decided to sleep and explore Reykjavik on our first day in Iceland, then return to the Blue Lagoon on our second day. Upon arrival, the first thing to do at the Blue Lagoon is decide which spa package you want to buy. Basic entrance in the summer months (the “standard” package) is about $45 USD and you’ll need to bring your own towel. For a more extravagant experience, get the Experience for about $95 USD. The Experience package includes entrance, a towel, a bathrobe, a mask, a drink at the swim-up bar in the Blue Lagoon, and the lunch buffet at LAVA Restaurant. If that’s not indulgent enough for you, there’s an Exclusive Experience package you might enjoy. Once you’ve paid for your package, you’ll be given a bracelet that track your purchases and allow you access to the lockers, then you’ll head toward the locker rooms. At this point, I was annoyed when all of the lockers on the main floor were full; I needn’t have been because there are more locker rooms upstairs. You use your bracelet to open and lock the lockers and the instructions are a bit confusing. To claim an open locker, close it, then quickly swipe your bracelet in front of the nearest sensor. Be sure to remove all jewelry, as the sulphuric water can corrode metal. Hose off in the communal shower (yes, you have to get naked) before suiting up and heading into the Blue Lagoon. The Blue Lagoon is family-friendly, but note that kids under 7 are required to wear arm floaties (which are provided). Our 9-month-old son loved splashing around in the water and didn’t mind the arm floaties at all. Once you’re in the Blue Lagoon, you’ll have no trouble finding your own space to relax. Hang out by the back wall for maximum heat. When you want to cool off, head to the swim-up bar and order a cold beer or sparkling wine. If you need a break from lounging in the water, relax in the sauna or geothermal steam baths. For a natural massage, stand under the waterfall then apply a mask of white silica mud, which is said to be great for your skin. You’ll be sure to work up an appetite after all of that lounging, so head to the LAVA Restaurant for an extensive lunch buffet. The buffet is about 3900 ISK ($32 USD) per person and is included in the Experience and Exclusive Experience packages. You’ll see traditional Icelandic foods like local fish and seafood, meat soup, lamb, and skyr (Icelandic yogurt) on the menu. For lower-key fare, dine in the cafe, where you’ll find sandwiches, salads, paninis, and chips. A panini is 1350 ISK (about $11 USD) and you have a great view of the Blue Lagoon. After your meal, you may want to relax even more with a massage, head back into the Blue Lagoon, stop in the gift shop for Icelandic clothing and souvenirs, or call it a day. It may be a bit of a tourist trap, but there’s something magical about the Blue Lagoon. It’s crowded, but there’s plenty of space to spread out and relax in the geothermal pool. I would definitely recommend a stop at the Blue Lagoon if you find yourself in Iceland, even just for a short stopover on your way to mainland Europe. You can fill an entire day with a trip there, but I was content after a solid half-day. The Blue Lagoon is a conveniently located, family-friendly destination in a beautiful country. If I’m in Iceland again, I’ll be sure to return to the Blue Lagoon. Have you been to the Blue Lagoon in Iceland? What did you think of it? Would you go back? It may be a tourist trap, but it looks unique — I’d go in a second. It is definitely unique. There’s a lot of geothermal activity in New Zealand, too, but I didn’t see anything like the Blue Lagoon when I was there. It felt touristy, but not in a bad way. I would definitely go back. I’ve always wanted to visit the Blue Lagoon and still want to even though I know it’s very touristy. It’s totally worth it, even though it’s touristy. You can even do it in a day if you have a long layover in Iceland on your way to/from Europe. Hope you have a chance to check it out. I wanted to say thanks again for submitting this article to the Byteful Travel Blog Carnival, and also: Congratulations! This article has been highlighted in the 15th BT Blog Carnival, which was published today. It looks like such a unique and otherworldly place… I especially loved the picture of you two and the baby. So cute! If you could retweet, stumble, or “Like” the blog carnival, I would really appreciate it. 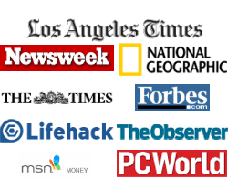 It would also help people discover your article, too; especially since your article is one of only 3 that I highlighted. Thanks! Looking forward to your submissions next time! I’m stopping over there for a few days next year and been told by my travel agent I MUST visit the lagoon! Bookmarking this for reference. Any other advice for things to do and see in Iceland? Definitely visit the Blue Lagoon! If you have a few days, rent a car. You could see Reykjavik and then head east along the coast. There’s a beautiful national park (Skaftafell) if you have to time to make it there. There’s great hiking and a glacier. There’s also a glacial bay a little further, but it might be too far if you only have a few days. Look into it, though. It’s very cool. We still have some Iceland posts we’re working on, so stay tuned for more Iceland trip info.